My column in the newspaper only runs about 720 words, or just about enough room to begin in a fashion, make a point, and then wind up. A benefit, generally, in our age of Internet-stunted attention spans. Though such limits can be frustrating when you have material as rich as "Narrative of the Life of Frederick Douglass, An American Slave." You leave stuff on the cutting room floor that doesn't really belong there. "I was born in Tuckahoe, near Hillsborough, and about twelve miles from Easton, in Talbot County, Maryland. I have no accurate knowledge of my age, having never seen any authentic record containing it. By far the larger part of the slaves know as little of their ages as horses know of theirs, and it is the wish of most masters within my knowledge to keep their slaves thus ignorant." Within those three sentences, Douglass establishes all the parameters of his tale: his tantalizing proximity to freedom, just across the border in Pennsylvania; his inherent concern for the truth; the position of people held as chattel, on par with animals, and their owners' desire to keep them sunk in profitable ignorance. The opening had nothing to do with the point of yesterday's column—given how Christianity energetically supported the enormity of slavery, its support of Donald Trump should puzzle no one—but I really wanted to mention it, along with one line written by Douglass, who had no formal education and wasn't taught to read until he was 12 or so. He is discussing a subject he finds embarrassing—his conviction that God Almighty was directing particular favor toward him. He believed that, though born a slave, divine providence was guiding him toward freedom. He admits this conviction reluctantly, noting: "I prefer to be true to myself, even at the hazard of incurring the ridicule of others, rather than to be false and incur my own abhorrence." Bingo. Most people can't write, not because they are unable to string words and sentences together, though that certainly is a factor too. But because they try to make themselves look good, by leaving out hard truths that run counter to their self-estimate, or undercut their pride, or make them feel slightly ridiculous. That makes their work both dull and puffed up, a bad mix. I used a phrase, more succinct though not as elegant as Douglass': "You can write some interesting stuff if you don't care how you look." Douglass understands that if you are honest, the reader will follow along with you, and forgive a multitude of sins. 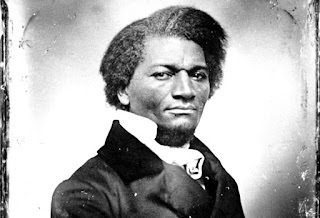 Besides, Douglass is right—a generous providence, or Divine Will, or dumb luck, or something, conveys him, Daniel through the Lion's Den, out of the hellscape of slavery, and into the history books, a part of which he has written himself. Tobias Wolff, IMO America's greatest living memoirist, agreed with you and Douglass. He said that the key to writing a good memoir was to take no thought of your own dignity. I trust Neil will be gratified that he has inspired at least one reader to get on the stick and actually read what Douglass wrote rather than simply relying on his reputation, which is nothing to sniff at either. Douglass should be proud: I got all of Jane Austen for 49 cents; his "Narrative" cost 99 cents. Kindle of course. I read it sometime during my high school years. It wasn't required; I think it had something to do with research for an essay. I'm embarrassed to say that I don't remember much about it. Time for a re-read.